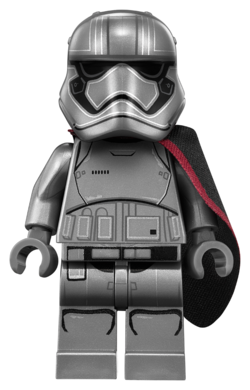 Captain Phasma is a Star Wars minifigure released in 2015. Phasma served as a Captain in the First Order. She was known to have worn a silver First Order stormtrooper armour designed from chromium metal, retrieved from the hull of Emperor Palpatine Ceremonial Ship. She is the arch-enemy of Finn, a renegade stormtrooper that turned to the Resistance ranks, as formerly she was in charge of his indoctrination. Captain Phasma in LEGO Star Wars: The Force Awakens. This page was last edited on 5 January 2018, at 12:01.